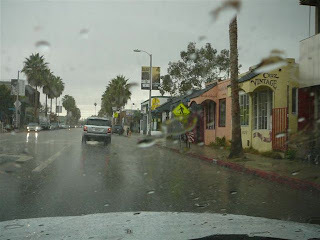 Experiencing Los Angeles: Winter Rain, or Lack of It: Experiencing L.A.
Winter Rain, or Lack of It: Experiencing L.A.
Winter Rain. It's something Los Angeles, and the rest of California needs badly. Los Angeles' Mediterranean climate is found in five places on earth: Southern California, Central Chile, Western/South Australia, South Africa, and - of course - the Mediterranean. Historically, it means cool, wet winters ... and warm dry summers. I say historically, because Los Angeles, along with the rest of California, is in the middle of an extreme drought. 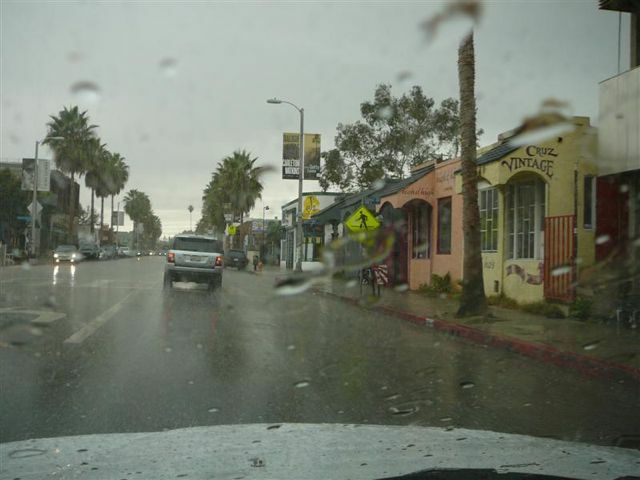 While the rest of the nation is dealing with an arctic vortex, Angelenos are basking in warm, sunny days - and the worst drought in over 100 years. 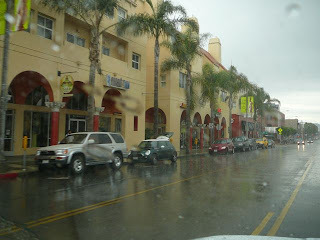 These photos were taken along Main Street in Venice and Santa Monica a few years back. 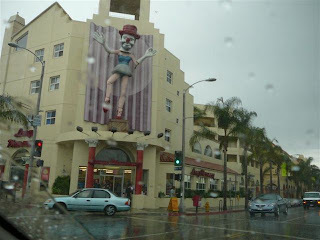 The Clown Building, located at the corner of Rose and Main in Venice. 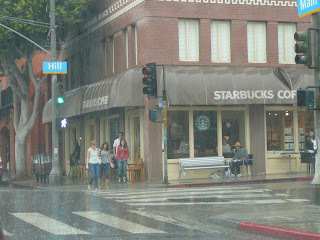 Starbucks (yes, they're everywhere), corner of Hill and Main in the Ocean Park district of Santa Monica. Pouring rain. 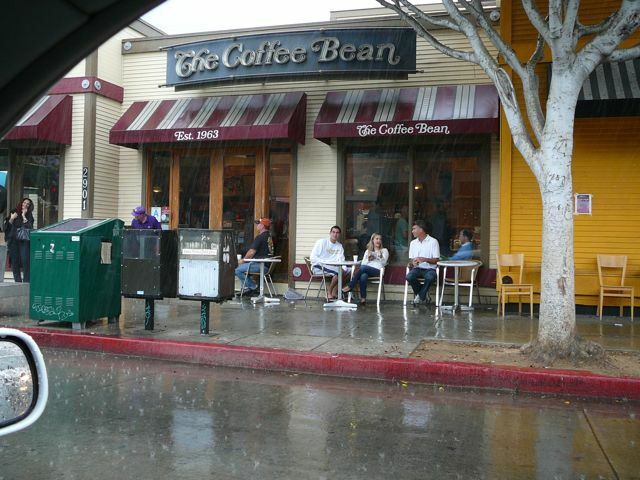 Yes, it really rains in Southern California. I like how everyone is in a state of denial, just sitting outside. What is this, Florida? 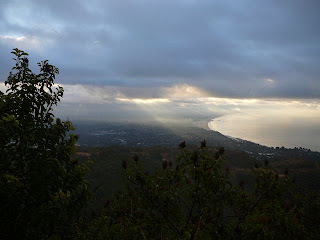 That same day I continued on a few more mile up the coast to enjoy a hike on the Paseo Miramar trail in Pacific Palisades. 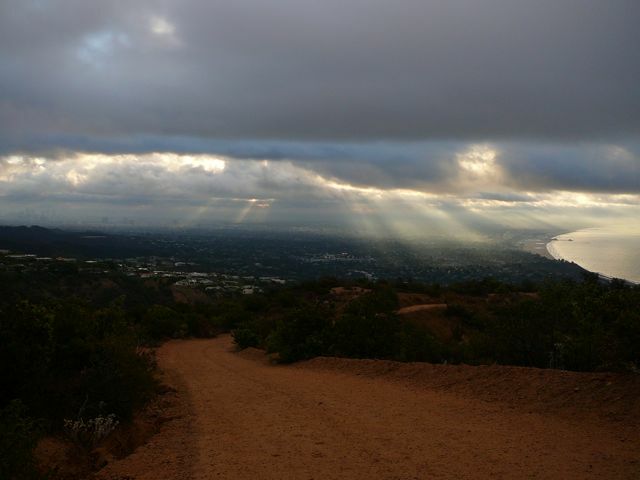 Steep hill, great workout, and incredible views - especially after a rainstorm. 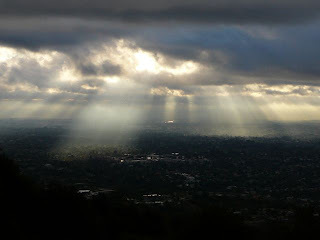 "Divine Providence" is the term used to describe God's provision - in terms of rain and everything else. In addition to normal rainfall, drought and flood are also part of the created order - and the natural cycle of life. It doesn't negate a trust in God's provision to build reservoirs and plan for years with little to no rain. In the mean time, regardless of one's theological beliefs, it's important not to not waste what we have. Water is a very precious commodity. Of course, if water was more expensive, you'd see a lot more conservation. My wife, kids, and I lived in L.A. for five years. Water - most of which is piped in from elsewhere - was relatively cheap. If fact, as crazy as it sounds, thousands of small apartment buildings in L.A. have one water meter for a 6 or 8 or 10 unit building. Water is just part of the rent, regardless of how much you use. So, at least in apartments, what incentive is there for the average Joe (or José) to conserve? Meanwhile, along the California central coast, where we now live, water is four times more expensive. No one needs to be reminded to use water sparingly. It's too expensive to waste. 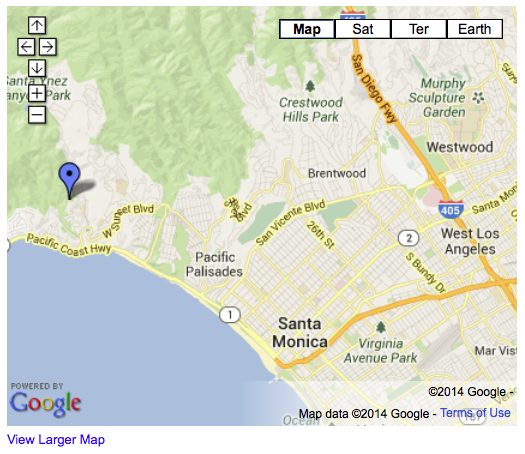 The Paseo Miramar hike trailhead is located at the end of Paseo Miramar in Pacific Palisades. Great hike. I highly recommend it. Parking is along the street, which can get very full on weekends. Please be respectful of the neighbors, and watch for no parking zones.